Sadly, 80% of the Giant Panda’s habitat was destroyed in only 40 years due to humans clear-cutting their forest habitat between 1950-1990. Now, researchers believe there are only about 1,000 animals left in the wild. Furthermore, according to Chinese research, 85% of China’s wild Giant Pandas are resident in Sichuan province. 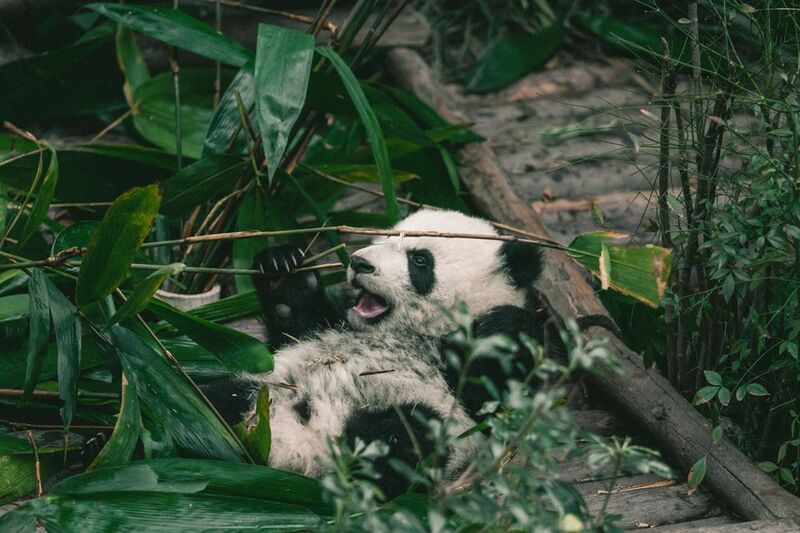 Established in 1987 and opened to the public in 1995, the base aims to increase the population of giant pandas and eventually release some of the animals back into the wild. However you feel about seeing animals in captivity, especially in a country not known for their excellent treatment of animals, the people at the Giant Panda Breeding and Research Base are making it their mission to increase the world’s panda population and further people’s understanding of this amazing creature. Pandas are loners and like to hide in their mountainous bamboo forest homes in Sichuan province. Click this link to read more about the habits of China's Giant Pandas. The center is located about 7 miles (11km) north of downtown Chengdu in a northern suburb. Plan on spending 30-45 minutes getting there from the center of town. The address is 1375 Xiongmao Avenue, Chenghua, Chengdu | 熊猫大道1375号. Incidentally, the street name translates into "Panda" Avenue. Around 20 giant pandas reside at the base. These are open grounds for pandas to roam freely. There is a nursery where babies are cared for. On the grounds, there is a museum covering pandas’ environment and conservation efforts as well as separate butterfly and vertebrate museums. Other endangered species, such as the red panda and the black-necked crane, are also bred there. Getting there: Taxi is your best bet and there is a taxi stand outside the entrance for you to go to your next destination. Public buses do run there but you’ll have to change several times. Organized tours including transportation can be arranged through your hotel.​ For more details, visit the Panda Breeding Base website "Getting Here". You can find detailed instructions on how to get there by public transportation including the metro. Stroller Friendly? Yes (mostly), there are some steps and bumpy rocks to negotiate. Go early during feeding hours (8-10am) for the best chance to see the pandas in action – they sleep the rest of the day. Several years ago, we took our three-year-old son on the excuse that he'd love to see the pandas, but we'll be honest, we were the ones who wanted to see them! It was very worth the three-hour flight from Shanghai to Chengdu to visit the Breeding Center. We really got an up-close visit with the pandas. During our visit, a mother bear and baby frolicked on the grass and around their play-gym for at least an hour. The mother clearly wanted to get her cub to drink some milk but he was only interested in tackling her and jumping on her. It was adorable to watch and they weren't the least concerned with the crowd that gathered to enjoy their morning mirth. In another enclosure (the pandas are in open enclosures with large amounts of green space and huge play structures), an adult panda was very busy munching away on some bamboo. He had a stack behind him and after he meticulously tore away the outer green bark, and ate all the inside pulp, he leaned back with arms over his head to grab another branch. An adult eats up to 40kg (over 80 pounds) of bamboo a day. Nearby, another adult was trying in vain to dig a hole through the wall of his enclosure to get next door. A lady friend perhaps? The breeding base was a delightful experience. The grounds are lovely and there's a large lake with numerous birds including peacocks and swans wandering around. My little boy enjoyed it very much but wondered where the gorillas were...in his world, where there are pandas, there are also gorillas. More Than Pandas? Chengdu Has Much to See and Do. Save money on air fares in Asia on these 10 airlines in the region. Have You Got What It Takes to Reach Everest Base Camp?